Made entirety of iron, with a hollow, naturally modeled hand furnished with a movable thumb and paired fingers, internal ratchet mechanism and external push-button release, and a tubular socket comprising of a long outer plate fretted with a pattern of repealed chevrons, and short inner section formed of plain and scalloped riveted strips, each fitted with buckles for the attachment of a harness. It is not unlikely that armourers, with their proven skills in working and articulating metal to the forms of the human body, would have been among the first craftsmen to involve themselves in the manufacture of functional artificial limbs. 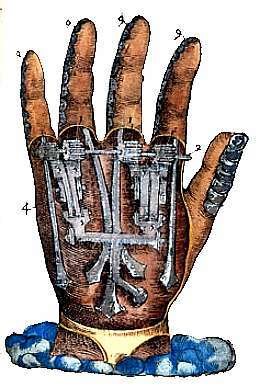 In the case of the hand shown here, both the thumb and the paired fingers are capable of being independently locked in several positions by means of an elaborate system of ratchets and spring-operated pawls that can be instantly released by pressure on a push-button protruding from the back of the hand. 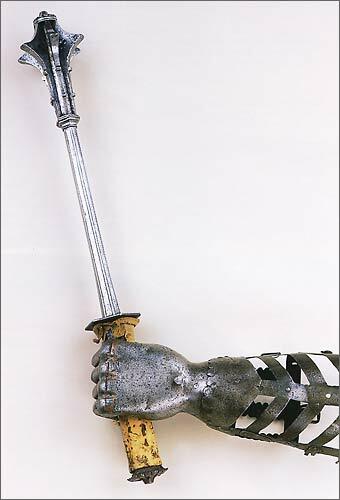 The earliest surviving hands of this kind are those made for the celebrated Franconian Knight, Götz von Berlich (circa 1480-1562), raised to heroic status by the young Goethe in his childrens' drama of 1772. Two are preserved in Schloss Jagsthausen, and a third in Schloss Grüningen bei Riedlingen. They were clearly made after 22 June 1504 when the twenty-four year old Götz lost his right hand to a cannon ball at the siege of Landshuf, but probably no later than 1512 when a prisoner of the Nuremberg campaign recorded that er hab auch Gotzen von Berlingen mit de rein hend aigentlich gesehen, hab an der eysinen hand ein handschuch gehapt (he personally saw Gotzen von Berlingen with the one hand, having had a glove on his iron hand). With his 'iron hand' Götz distinguished himself in a long active military career. According to a verse composed by Count Franz Pocci in 1861, it allowed him to securely grip both his lance and his sword. The earlier of the two Jagsthausen hands is constructionally very similar to the present example. 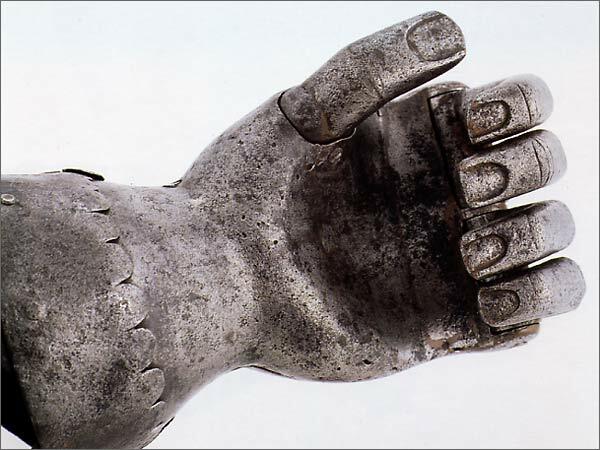 All three of the hands of Götz von Berlich, however, have a somewhat angular form, reflecting their early date. The present example, with its more carefully modeled hand, can be compared with one recovered from the grave of die Knight Hans von Mittelhausen of Balbronn, Alsace, who died in 1564, as well as another in the Hessisches Landesmuseum, Darmstadt, which is said to have belonged to a Swedish officer who fell in the Thirty Years War (1618-48). Other examples of this mid-16th to early I7th century type can be recorded in the Museum Otto Ludwig, Eisenfeld, Thuringia, the Bayerisches Armeemuseum, Ingolstadt, the Livruskammaren, Stockholm, Schloss Skokloster, Sweden, the Museo Poldi Pezzoli, Milan, the Fitzwilliam Museum, Cambridge, and the Welcome Medical Collection in the Science Museum, London. Absolutely incredible. Thanks for posting! Awesome article. That Götz must have been a powerful and unpleasant sight in his german armour, an iron hand-prosthetic and 80years worth of scars! Really fascinating stuff! Thank you both for sharing this! How COOL are these! It reminds me of the highly detailed and articulated metal sculptures that many Japanese arourers began to produce as demand and regulations made for much less call for thier products twords the close of the 19th century. Hard shelled marine life were favorite subjects. I have that same Peter Finer catalogue and really admire that prosthesis. It's interesting that the fingers are grouped as we see on bifurcated gauntlets. It's really incredible craftsmanship. Wow. I had always hoped to see a good example of one of those. Quite an amazing piece, and very beautifully detailed. The frill of a 'sleeve' is a very nice touch. I also wonder somewhat at the structure. How thick the walls of the fingers are (I'm assuming there tube-like), and things like that. Thanks for sharing it with us, Nathan! Are the pictures reversed? He lost his right hand, but prosthesis looks like a left hand. I don't think the one Nathan has pictured is his, just "an" prosthetic hand. The one shown further down is "the" Gotz hand. I don't believe this prosthetic hand is attributed to anyone in particular. The catalogue is comparing it to ones made to replace Götz von Berlich's right hand, not stating it was made for him. Wow! If, God forbid, I ever lost a hand, I'd want one of these! Imagine what a conversation piece that would be! No flesh-colored plastic for me, thanks. Here's a couple illustrations of a 16th Century design by Ambroise Pare, displaying some of the device's internal mechanisms. Thanks Nathan, those are great! 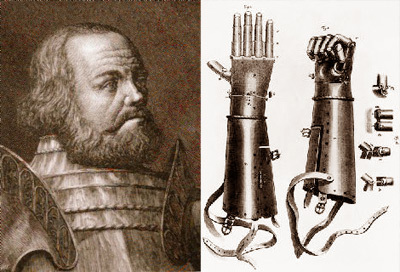 One of my heroes, Francois de la Noue, was also an "Iron Hand", having lost one of his flesh and bone ones during the long French Wars of Religion and having it replaced with an iron version. He met his demise (I think he was well into his 60's at the time, too) when his hand locked on a scaling ladder during an assault on a town, and he couldn't release it. But it had served him well for several decades prior to this unfortunate happenstance. If anyone has a copy of the August 2000 issue of Military History there is an article about Gotz by David Zabecki. It is quite interesting and covers some of the shifting alliances and outright opportunism shown. When you take into account that Gotz was involved in six or seven wars and probably a dozen or more major feuds it's surprising that he lived to 81 with only one hand missing. 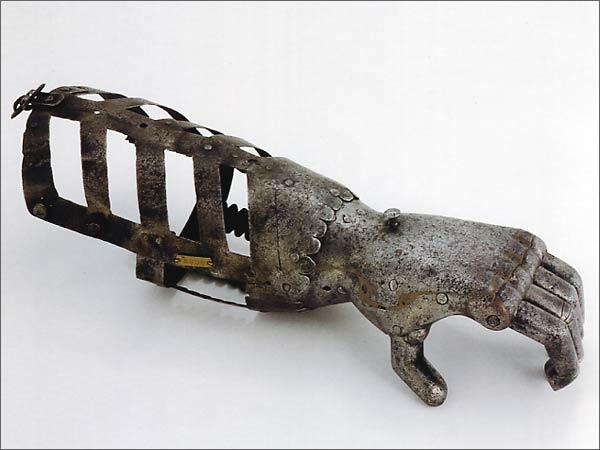 According to the article in MH the artificial hand is still on display in the museum of the castle at Jagsthausen. Probably not a good idea in practice...but imagine getting in a barroom brawl with somone who's using an iron prosthesis. They have one such arm on display in the Royal Armoury in Stockholm. Unfortunately my camera had somewhat diverging ideas about where to place the focus, but it's somewhat visible at least. I've been reading a bit of background information on Gotz von Berlich. He was a man not to be trifled with. I can't imagine using this type of prosthesis, especially knowing he would keep making his living by way of battle. I've read that with this prosthesis he was able to hold a lance, play cards, direct his horse and even hold a quill to write. He was a true tough guy.